The hometown of the national hero of Nicaragua Augusto C. Sandino, after whom the Sandinista movement was named, Saturday witnessed hundreds of people who took to streets to seek justice for the dozens of people who died in clashes in the country since Apr. 18. "We are present today in Niquinohomo to demand freedom, justice and democracy," said an anti-government activist. The protesters also called for the resignation of the President, Daniel Ortega, his wife and the vice-President Rosario Murillo. Niquinohomo, located 43 kilometers (26.7 miles) south of Managua, was painted with the blue and white colors of the Nicaraguan flag on Saturday, and witnessed huge crowds of people who joined the protests. Men, women and children in shouted: "Justice ", "They were students not criminals," while passersby raised their fists in support. Residents from at least three neighborhoods joined the protest that ended in Niquinohomo's central park. Following the death of at least 45 people in anti-government protests, scores of Nicaraguans have separated the "Sandinismo" from the figure of Ortega, who is now compared with the dictator Anastasio Somoza Debayle, overthrown in 1979 by the Sandinista movement. After the crisis began, Niquinohomo's population has started claiming to be Sandinistas and not pro-Ortega. The Nicaragua crisis Saturday entered its 18th day as huge marches backing and against President Ortega, initiated by demands for social security reform, continue despite the fact that the president revoked his decision due to scores of deaths from repression. 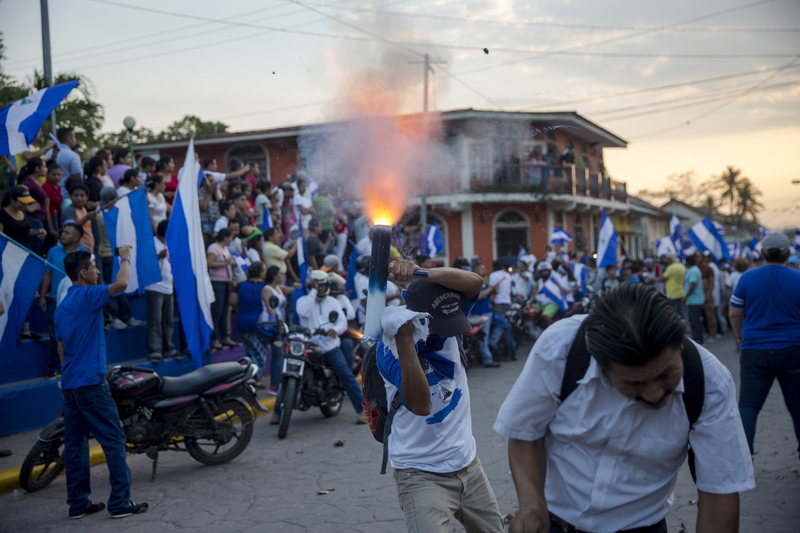 The violent clashes in Nicaragua have left at least 45 dead, the majority between Apr. 18 and 22, according to the Nicaraguan Center for Human Rights, while other humanitarian organizations raised the number of deceased to 63. Nicaragua is awaiting a dialogue between the government and the private sector, with the Episcopal Conference as mediator, although no date has yet been fixed.